This is one of the best books I've read in a long time. In fact, I read it a few months ago, then lent it out, it came back to me recently and I spent an lovely afternoon reading it again. History, literature, romance, humour, and tragedy fill the pages of this book that is, ultimately, a celebration of life. It's a book that I hate to see end, yet I race towards the finish line, breathless to see what's going to happen. Re-reading it is satisfying, because I can enjoy the nuances of the characters. And when I finished it, I closed the book, sighed, and put it away to read again one day. Lorrie , it is also one of my favourites. I go back to it time and time again. So sad that it was the only book that she wrote. This was an interesting read. It was a selection for our discussion group at the local library. 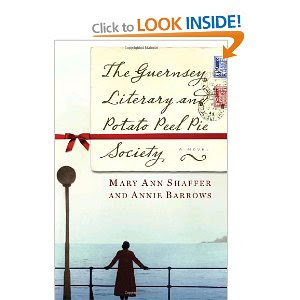 It sent me right to the computer to learn more about Guernsey. I have looked at that book several times on trips to the library and it is on my list of must reads this summer. I read this last year and loved it - have since bought it as a gift for others. It really is one of those books to re-read. Oh...must get it. I am so often disappointed in fiction. I love to read, but it's hard to find good books anymore. Oh I loved this book..I cried, laughed and smiled all through it..must read it again..thanks for the reminder.. I so enjoyed that book! I read it while we were vacationing on the island last year...a few chapters in Parksville and some more in Telegraph Cove. Great book. I was fortunate enough to have lunch with Annie and her stories about Aunt Mary Ann, were wonderful. I agree, that was a wonderful book! And now you kindle the desire to go and find it to read again. I borrowed my sister's when I first read it. Say, have you by chance read Erica Bauermeister's The Essential School of Ingredients. That book for me resonates that same way you same this one makes you feel. So if you have not read it, I think you might love it too.